Ray Stevenson as Frank Castle in Lexi Alexander’s Punisher: War Zone. 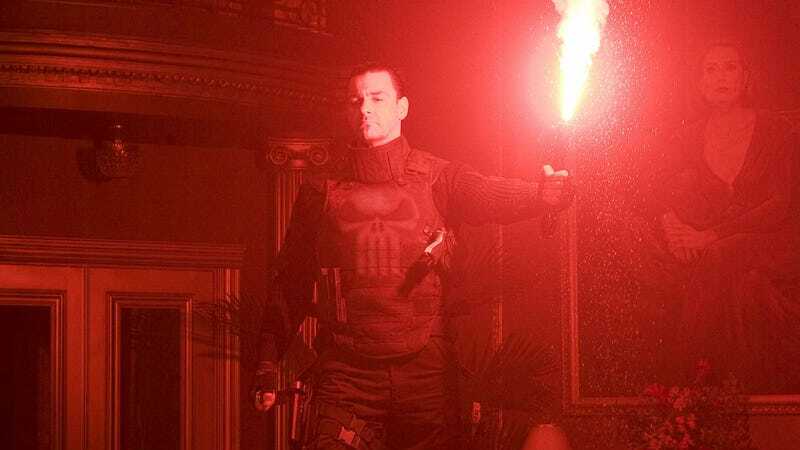 A decade has passed since Punisher: War Zone shocked audiences and caused critics to say director Lexi Alexander should be “put in prison” for depicting such gruesome scenes on screen, as violent vigilante Frank Castle continued his quest for vengeance by taking out the organized crime groups that murdered his family limb by limb…quite literally. The movie’s bizarre awards season release date is just one of many now legendary facts that have helped build a cult fandom around the movie. Yet it’s a testament to how ballsy, brutal, and utterly bonkers the film was that in 2018, the audience for Marvel’s third attempt at the franchise is bigger than ever. Raised by a German mother and Palestinian father, Alexander originally started off her career as a martial artist and had an unlikely path into the world of show business. She was a world kickboxing champion at 19 when Chuck Norris convinced her to move from Germany to the U.S. and work as a stuntwoman, even going as far to sponsor her green card. As she transitioned to working behind the camera instead of in front of it, she was still only in her 20s when she became one of the most sought-after action directors due to her practical experience and visual flair. It made her an ideal candidate for Punisher: War Zone. The movie aimed to go in a different direction than 2004’s The Punisher, which starred Thomas Jane, and was on an entirely different planet to 1989’s The Punisher, which featured Dolph Lundgren as Frank Castle. Dominic West (Jigsaw) and Doug Hutchison (Jim). At first Punisher: War Zone was due for its theatrical debut in September 2008, but the scheduled release date of another high-octane Lionsgate movie—Transporter 3—led the studio to inform Punisher’s team that it was being pushed back to December. Initially, that was sold as a positive step, with executives telling various members of the production there would be “an extra marketing spend” to release trailers and build a campaign to position the film as alternative programming throughout the competitive Academy Awards season. Lionsgate executive Joe Drake, actor Ray Stevenson, and director Lexi Alexander attend the after party for the film Punisher: War Zone at the Level 3 club on December 1, 2008 in Los Angeles, California. In a year when Marvel Studios had a hit with Iron Man and a flop with The Incredible Hulk, Punisher: War Zone barely lasted three weeks in theaters, struggling to scrape in over $8 million domestically and bringing its global haul to just a little past $10 million—well shy of its $35 million budget. In short, nobody really saw it...and the critics who did? Their response was visceral.